﻿ Getafe 1-2 Real Madrid. Ronaldo comes to the rescue! 14.10.2017 » Getafe 1-2 Real Madrid. Ronaldo comes to the rescue! 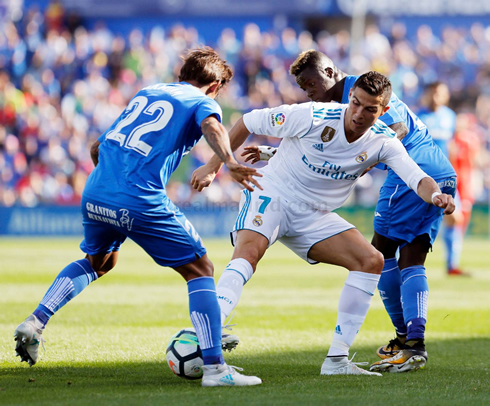 The international break seems to have had no negative effect on Zinedine Zidane's men, as Real Madrid returned to work and defeated Getafe in a 2-1 win earlier today at the Coliseum Alfonso Pérez. 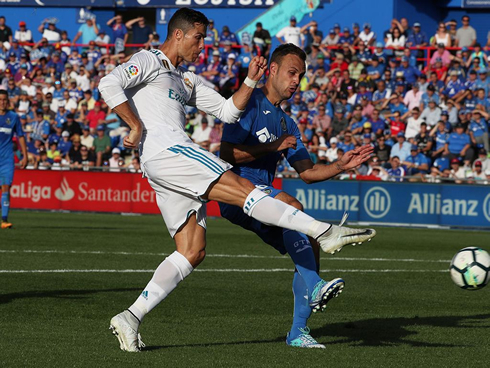 It was far from being an easy match for the European champions, who scored first by Benzema near the half-time break, but then saw Getafe equalizing things later in the second. The fate of this game was only decided in the last minutes of the second half, when Isco assisted Cristiano Ronaldo for his first league goal of the season. 3 points in the bag and now all attentions will turn to the Tottenham game next week. We should have learned by now never to count out Cristiano Ronaldo, but he will keep reminding us every time we begin to doubt him. Despite what was admittedly a horrendous game for CR7, he still came out on top in the end with a fantastic finish from an Isco through ball. These La Liga games are far from comfortable, but today can hopefully be a turning point for Madrid in the league and for Ronaldo, as well on a personal level as he's struggled so far in domestic play this campaign. With b set to visit the Bernabéu in the midweek, Zidane opted for a changed side today, resting some regulars for the big Champions League clash this week: Achraf, Vasquez, Casilla (deputizing for an injured Navas), Marcos Llorente and Nacho all played. This game was also the return of both Marcelo and Karim Benzema to the starting lineup, a welcome addition considering our troubles scoring in the league this season. Benzema had a fantastic match today, his holdup and buildup play was excellent and his goal was tidy finish as well, as he rounded the defender before slotting home well. The CR7 - Benzema partnership was not firing on all cylinders, but there was a marked difference in the final third at times despite the lack of success. b equalized after some timid defending in the box from Madrid. Marcelo was caught out of position and the square ball evaded everyone before Molina's slight touch took it past Kiko Casilla. 1-1 in the second half and it looked like Madrid would be dropping even more points. Soon after, Ronaldo would miss a golden chance practically on the goal line after a nice knockdown from Benzema. Ronaldo clutched the goal net as he seemed defeated, unable to figure out what was wrong. Sensing danger, Zidane threw on Isco and Theo Hernandez hoping their energy could be the key to the match and it would be the magician who could crack the Getafe defense. A lofted pass into the box found Ronaldo, who timed his run brilliantly, one bounce and a shot into the back of the net. Cristiano peeled off in celebration, but one could sense his relief as he ran to the bench without even doing his patented "Siuuu". Madrid were able to hold on and keep pace with Barça, but it was not easy. 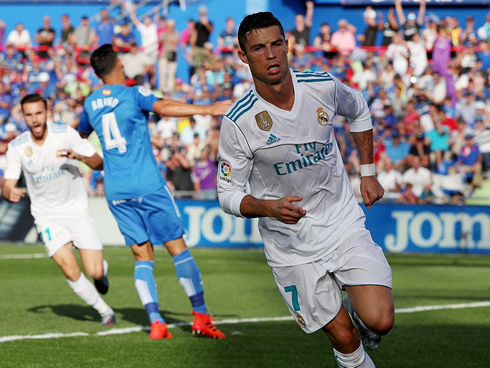 For Ronaldo, his first league goal could not have come at a better time and the weight off of his shoulders could bode well for the rest of the season, as Madrid attempt to make up the gap. Cristiano Ronaldo next game is for Real Madrid on October 17 of 2017 against Tottenham. You can watch Juventus live stream, Real Madrid vs Tottenham, Inter vs AC Milan, Southampton vs Newcastle, Brighton Hove Albion vs Everton, and Bayer Leverkusen vs Wolfsburg, all matches provided from our sports live game pages.